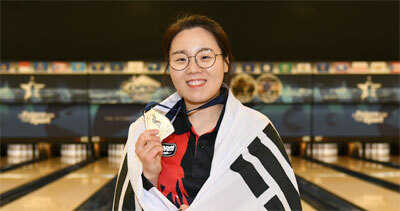 4th December, Las Vegas: 2015 Masters champion, Jung Dawun successfully defending the Women's Masters title to conclude the 2017 World Bowling Championships giving Korea their second gold medal while Canada's Francois Lavoie captured the Men's crown. Jung swept past challenger and Team Gold medallist, Sin Li Jane of Malaysia, with a convincing 2-0 victory in the women's title match. 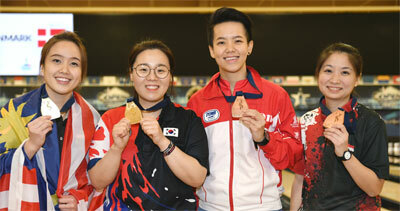 The 31-year-old Korean got off to a great start with three consecutive opening strikes as the Malaysian only down two strikes to trail by 23 pins. A split in the fifth frame from Li Jane proved to be costly. Jung added five more strikes from frame 6 to extend her lead and although Li Jane responded with four bagger, it was a little too late going down 225-256 in the first match. The Korean started the second match with five strikes-in-a-row as the Malaysian was playing catchup. Li Jane did fight back with five-in-a-row but Jung kept a clean game to take the second match, 236-221 and the Masters gold medal. The champion, who won Korea's first gold medal in the Doubles with Kim Minjeong, ironically beating Li Jane and her partner, Shalin Zulkifli, advanced to the title match with victory over Shayna Ng of Singapore, 2-0 in the semi-finals. The Malaysian, who settled for the silver medal, had to go to the third and deciding match to beat Indonesia's Sharon Limnansantoso, 2-1 in the other all-Asian semi-finals. The champion, who skipped Step 1 by being ranked No. 6, eliminated her team-mate, Kim Minhee, 2-1 in Step 2 finals and a second Indonesian, Tannya Roumimper, 2-1 in the Step 3 finals to reach the medal round. Li Jane ousted Team USA's Josie Barnes, 2-1 in Step 1 finals and sailed past a second American and Trios gold medallist, Kelly Kulick, 2-0 in Step 2 to advance to Step 3 finals where she swept past Denmark's Rikke Holm Agerbo with another 2-0 victory. Players ranked 9 to 24 in the All Events standings contested the head-to-head best-of-3 match Step 1 Finals. The winners, according to their original ranks faced players ranked 1 to 8 for Step 2 Finals. The winners proceeded to Step 3 Finals and winners of this step met in the medal round. 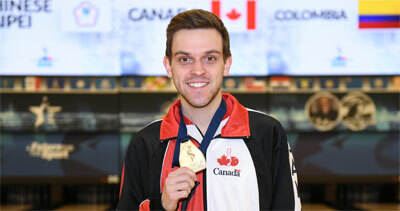 Meanwhile, 2016 U.S. Open champion and 2017 World Games Doubles gold medallist, Francois Lavoie of Quebec City ended Chinese Taipei's fine run in the Masters finals with a 2-0 victory to win the Men's gold medal for Canada. Lavoie, who also won two other PBA titles and voted the 2016 Harry Golden Rookie of the Year and the 2016 Southwest Rookie of the Year, comfortably took the first match against Xu Zhe-Jia, 247-206. The 24-year-old Canadian kept his composure to end the second match, 216-199 for a well deserved victory. The No. 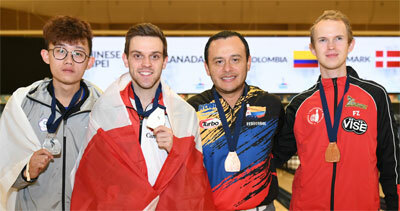 6 seed champion skipped Step 1 and then eliminated Trios gold medallist, Chris Barnes of Team USA, 2-1 in Step 2 finals. Lavoie ousted the first Chinese Taipei spinner, Chen Wu-Chi 2-0 in Step 3 finals to reach the medal round. Xu, seeded No. 7 did extremely well to add a third silver medal for Chinese Taipei. The 19-year-old student edged Takuya Miyazawa of Japan, 2-1 in Step 2 finals before brushing aside Germany's Pascal Winternheimer, 2-0 in Step 3 to reach the medal round. Team USA shared honours with Korea in the women's division with a 2 gold and 2 bronze medal each. Malaysia was third with a 1 gold and 3 silver medals. Team USA were the overall winners in the men's division with a medal tally with 2 gold and 1 bronze. Chinese Taipei finished second and Hong Kong third. Team USA emerged as the overall champion with 4 gold and 3 bronze medals. Korea second, contributed by the women only, was second with 2 gold and 2 bronze. Chinese Taipei 1 gold, 4 silver and 2 bronze and Malaysia had 1 gold and 3 silver medals. 15 countries won medals at this year's championships. A total of 213 men and 176 women from 42 countries (11 from the American zone, 13 from the Asian zone and 18 from the European zone) supported by 166 team officials, participated in the 11-day long world Championships hosted at the South Point Bowling Plaza, Las Vegas, Nevada, USA. There will be a World Bowling Executive Board meeting tomorrow followed by the 2017 World Bowling Congress meeting on December 6. Photos by Terence Yaw in Las Vegas, Nevada, USA.  Form D - Arrival & Dep.  Form G - Press Accred.